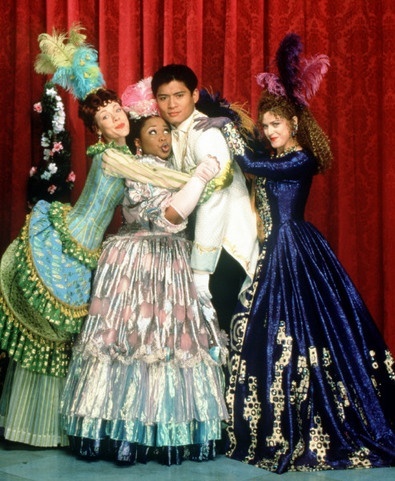 If there’s one picture I’ve been obsessed with lately, it’s this press photo from 1997’s Rodgers and Hammerstein’s Cinderella, starring Brandy, Whitney Houston, Whoopi Goldberg, Bernadette Peters and Paolo Montalban as Prince Christopher (aka “Prince Charming,” the only way we’ve ever identified the character in Disney’s 1950s animated version). I love how candid it looks (especially since some versions of it online clearly show a Fujifilm border). It could very well be a great candid shot—something about its energy seems highly off-the-cuff, and usually it’s the off-the-cuff pictures that turn out looking the best. The picture captures what could have been a random moment after Cinderella and Christopher’s wedding (even though she didn’t actually get married in the iconic blue dress in the film). The energy of it makes it one of my favorite pictures ever, not to mention one of my favorite pictures from the amount of PR photos I’ve seen. But like the picture above it, this one captures the feeling we’re told to expect from a wedding–pure happiness. 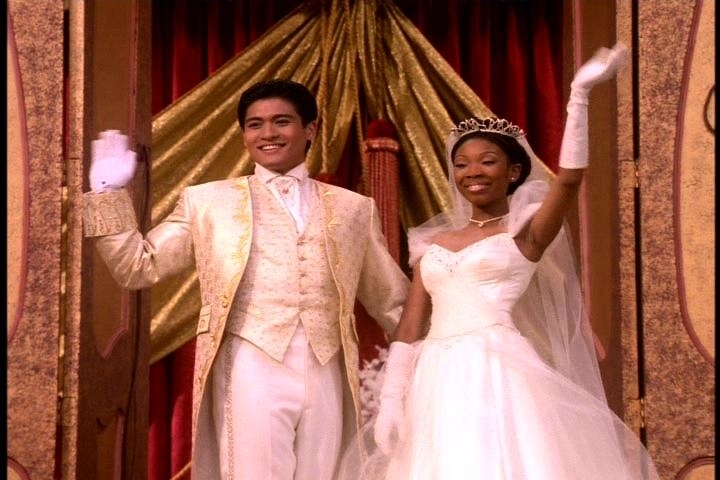 I’m sure little girls of color all around the country imagined a wedding day that looked as magical as the one Cinderella and Christopher had, and certainly I’m sure many (like me) were hoping they’d be able to find a Prince Christopher of their own. I’m not even big into the showiness of weddings, but even I have found myself wondering what a huge Cinderella-esque wedding would be like. 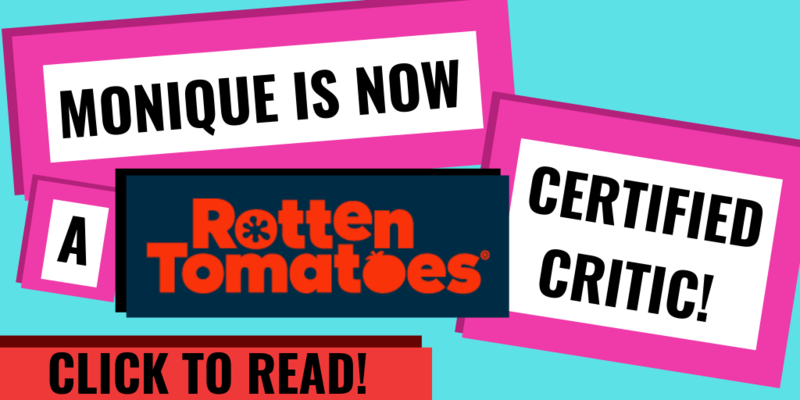 Not to mention, the film just celebrated its 20th anniversary. Thus, this post was born. 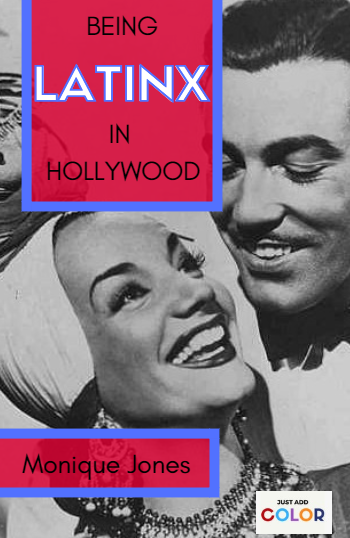 This post doesn’t have to be all about weddings—this post could be very useful for other big events in your life in which you need an elaborate ballgown (like prom, a Quinceañera, a huge cosplay event, etc.). But, if you’re a person who wants to go all out for your wedding or a fancy reception party, then maybe my suggestions could help you out. I’ve scoured the interwebs to find the perfect Cinderella dress and Prince Charming/Christopher suit, accessories and decorations, and even invitations. Keep in mind: I’m no wedding planner, but I am an artist, and that counts for something. 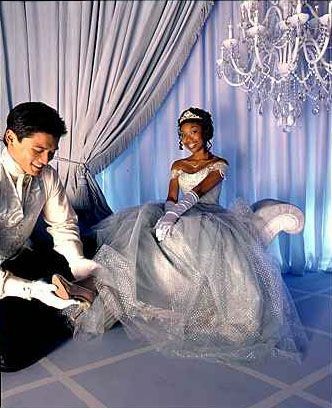 Please feel free to alter my suggestions for a Cinderella-themed wedding how you see fit. This is your big day, after all—I’m just offering my two cents. First of all, if you are a seamstress or know someone with wild tailoring/sewing skills, you could have someone custom-make this dress for you. With some of the options I’m about to show you, it might cost just as much (or maybe a little less) to have someone to make this dress for you. As you can probably already surmise, there’s no completely identical dress like this on the market. HOWEVER, that doesn’t mean that there aren’t some pretty close dresses online. 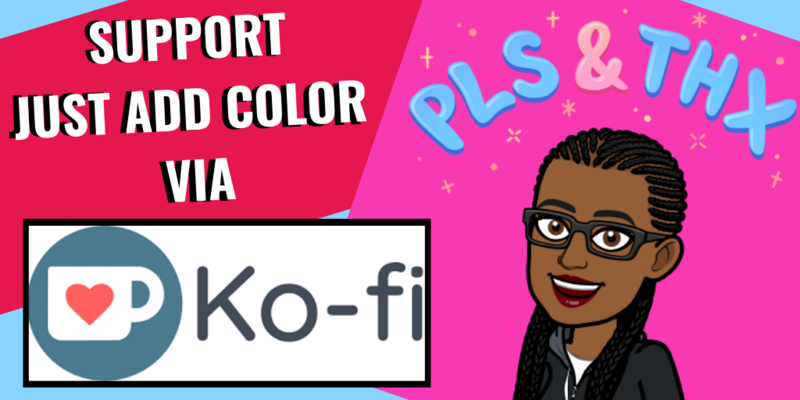 There are three ways you can go about doing this–get a Quinceañera dress or ballgown of some type, try Etsy, or find a white wedding dress of a similar style and pay extra to have the store dye it ice blue. 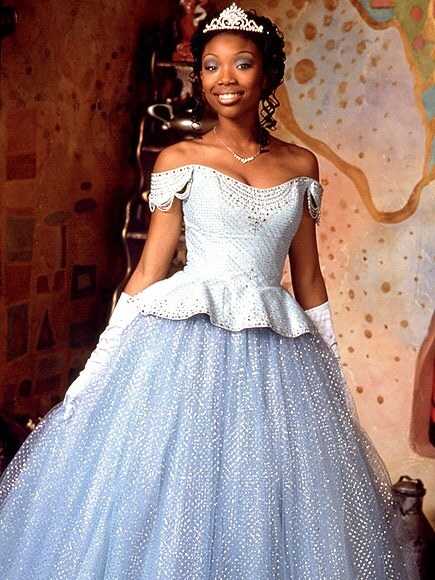 If you are as lithe in figure as Brandy, you might be able to get away with getting a Quinceañera dress to serve as your fanciful wedding dress. Yes, Quinceañera dresses are usually made for 15-year-old girls. But, because it’s for the day they finally reach womanhood, these dresses are made exactly the same as lavish ballgowns, but are much easier to find and purchase. 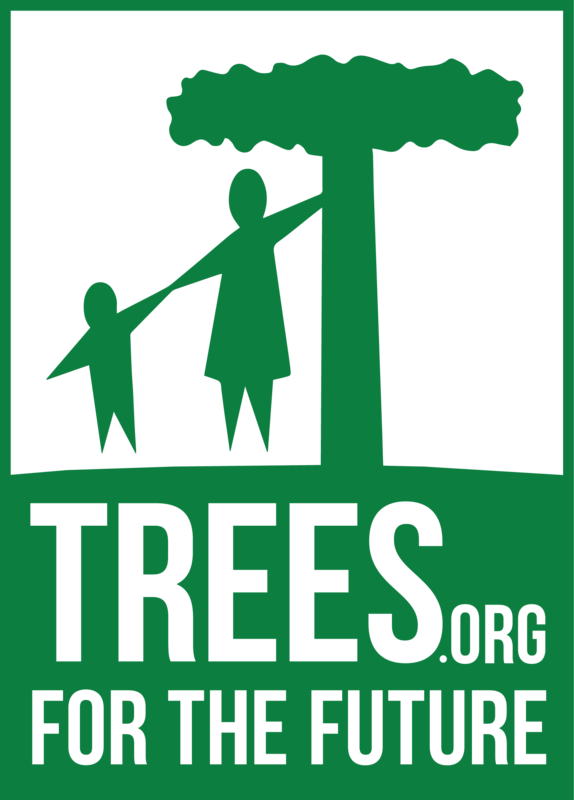 But, like lavish ballgowns, they cost an extremely pretty penny. The brand of Quinceañera dress that I’ve found several types of dresses can could work for a Cinderella themed wedding is Vizcaya by Morilee, an imprint of designer Madeline Gardner’s Morilee brand of wedding, evening, and party dresses. These dresses are the most opulent Quinceañera dresses I’ve seen during my search, and they are also the most mature looking. If you didn’t tell anyone this line was actually made for 15-year-olds, people would believe these were regular ballgowns, meaning that no one will be looking at you like you’re wearing a teenager’s dress on your wedding day. There are some extra straps, but it’s got everything you could ask for if you’re looking for a dress similar to Brandy’s blue dress. If you’re handy with tailoring, you might even be able to snip those straps away or hide them within the off-the-shoulder straps. I didn’t check the sizes for any of the Quinceañera dresses, so I’m only assuming you have to be skinny teenage-size to be able to wear these. There could be plus sizes for these, but you’ll have to check. In the event there aren’t, I found some real wedding dresses that are good for both smaller and plus size women. 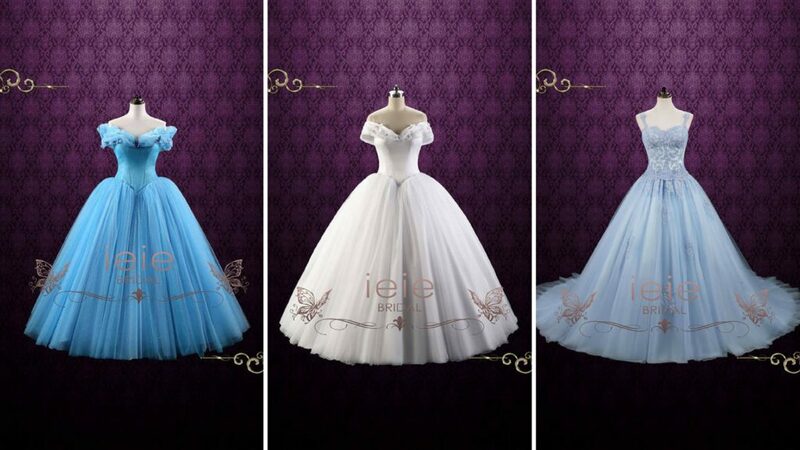 You can certainly dye these dresses ice blue (or pay someone to if you’re not into DIY with such an expensive dress), or you could just wear it as-is, which would be just like Cinderella on her wedding day in the film. 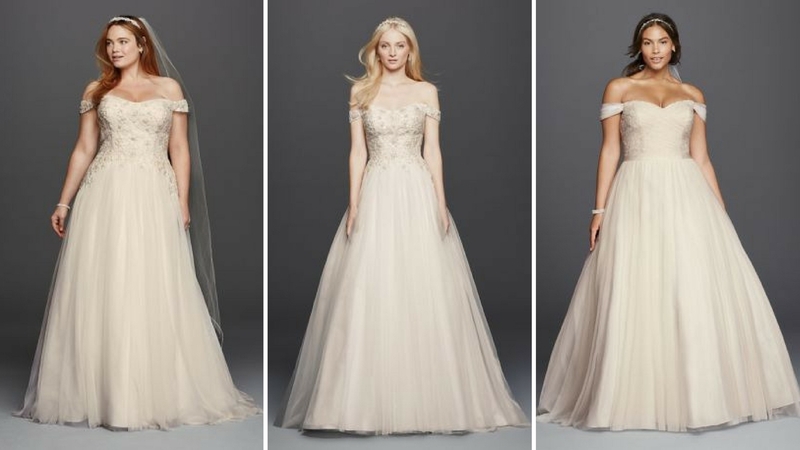 These designs are by Oleg Cassini, and they capture everything you want in both Cinderella’s ball gown and wedding dress. These two are by Morilee, the same designer as the Vizcaya Quinceañera dresses. With the ready-made items out of the way, let’s talk about Etsy. One shop, ieie bridal, makes gorgeous, made-to-order dresses. All you have to do is offer your measurements. These three in particular are great for Cinderellas-at-heart, especially the first one, which is a copy of the dress found in the recent Cinderella live action movie starring Lily James. If you’re down with Etsy, I think it’d be worth inquiring if the middle dress could be made in an ice-blue fabric. I don’t know what the designer/seller’s rules are for specifications like that, but since it’s a custom dress anyway, it wouldn’t hurt to ask. 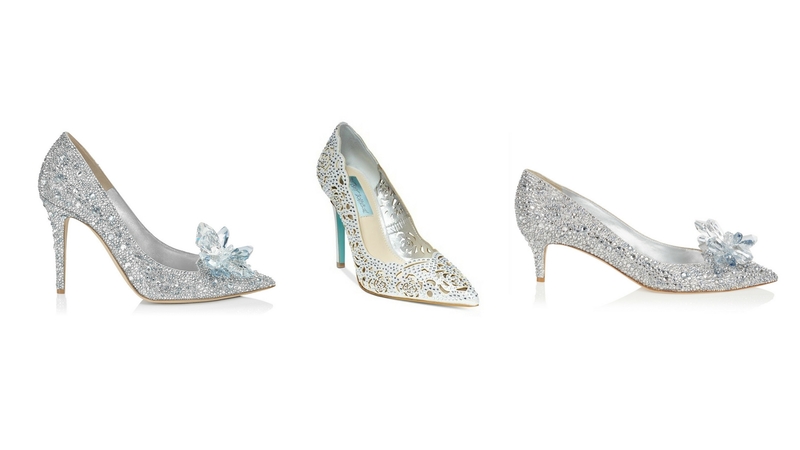 The glass slippers are paramount to a great Cinderella wedding, and while no one can actually wear glass and expect not to end up with cut-up feet, here are some (expensive) shoe choices. What I’ve found are two shoes from Jimmy Choo–from the Cinderella collection, no less–and a shoe by Betsey Johnson. The shoe search was by far the easiest part of this post. I only took about 15-20 minutes to find these shoes. You don’t even want to know how long it took to find the right wedding dress options. 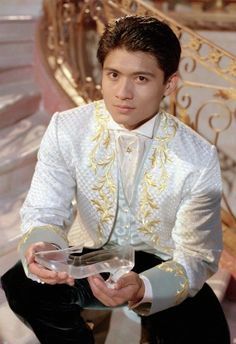 You especially don’t want to know how long it took to find something suitable and similar enough to work as Prince Christopher/Charming’s clothes. 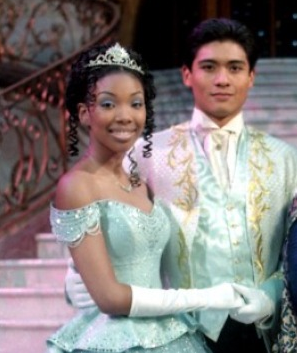 So instead, turn to makeup guru PatrickStarrr, who released a video celebrating Cinderella’s 20th anniversary. This picture, while gorgeous, is misleading. In this shot, the prince’s jacket looks like a pearlized white. However in the shot below, it’s the same ice blue color as Cinderella’s dress. I’m going with the latter, since it makes the most sense–I’d think the groom might want to be coordinated with the bride in this instance. However, the choice is yours. If you decide to go with blue, then…you’re up a creek without a paddle if you’re looking for a traditional tuxedo or even an 18th century cosplay jacket, because I’ve scoured the internet looking for an ice blue ornate tuxedo only to come up with nothing. As with Cinderella’s dress, if you want something exact, then find a costume maker who can make this to form. 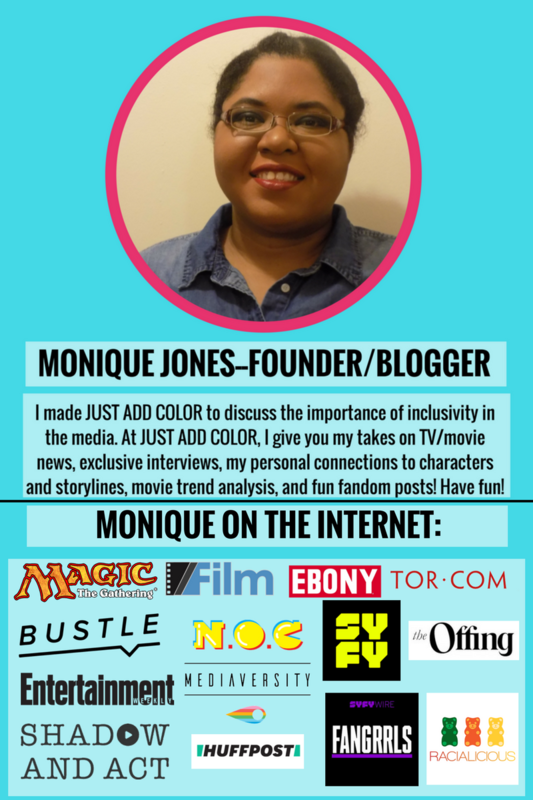 However, if you don’t feel like hiring someone or if you just want some options that could be quicker in the long run, here’s what I’ve got. I had to do some out-of-the-box thinking to come up with some of these options. For instance, the below options are Indian wedding clothes. 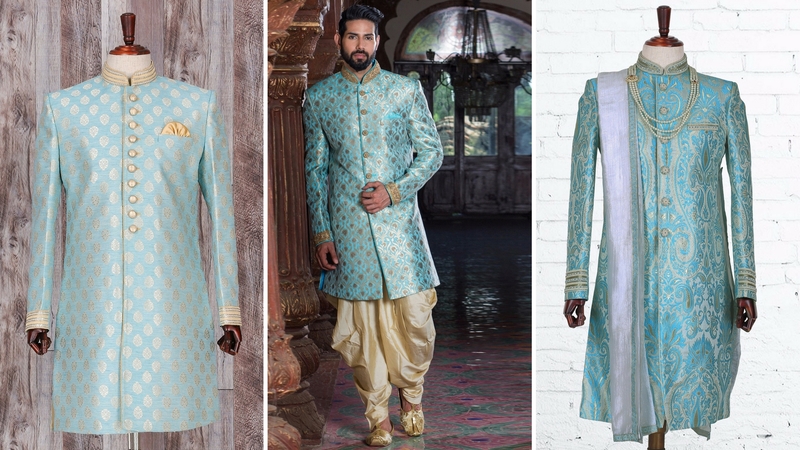 These sherwani weren’t easy to find–even with sherwani, which come in all the colors of the rainbow, it was still hard to find ice blue–but I think if you wear them unbuttoned with a vest and some black slacks, you’ll come out looking great. 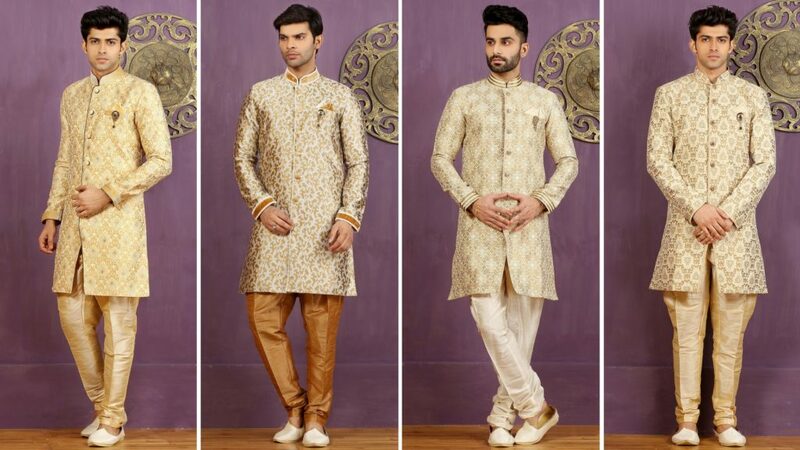 Note that some of these are the Indowestern style of sherwani, meaning they’ve got elements of both traditional Indian and Westernized clothes. Some sherwani are made like ornate tunics, and since these are button down, that makes it easier to imagine them operating like Western-style jackets. These three are from G3 Fashion. I should note that some of these, if not all of these, come with pants. If that’s the case, I’d suggest swapping out the original pants with tuxedo pants or slacks, as I mention above. Not because the pants aren’t cool (they are), but because the prince actually wears black pants with his blue vest-jacket combo. However, it’s your wedding–do what you want to do. As you’ve seen in the picture near the top of this article, the prince wears gold on his wedding day. If you want to go that route, then there are actually Western-style tuxedos you can wear. 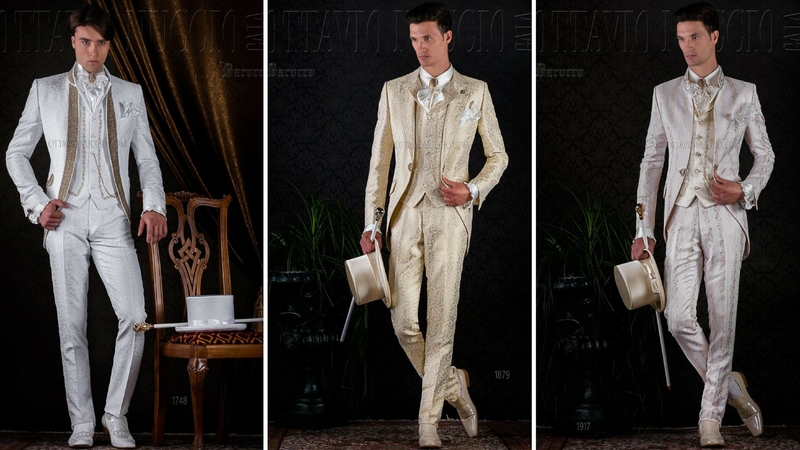 These three are made by Italian designer Ottavio Nuccio for his Baroque collection. And man, are they baroque. The only prices that are listed on his site are in Euros; I don’t know if there is international shipping. 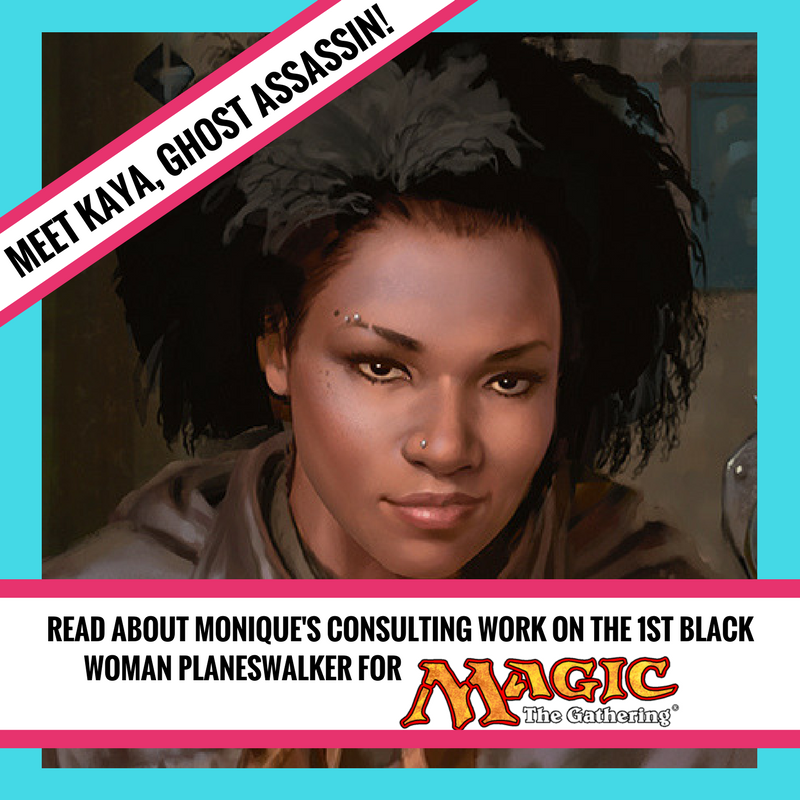 But I think there is a button you can click to inquire about pricing, so maybe more information will be there. You could also go back to the sharwani for your gold outfit. Utsav Fashion has a lot of great gold options. Again, take care with the pants–swap them out for Western pants or slacks if you so choose. There you have it–some creative ways to get your Cinderella wedding right and tight. 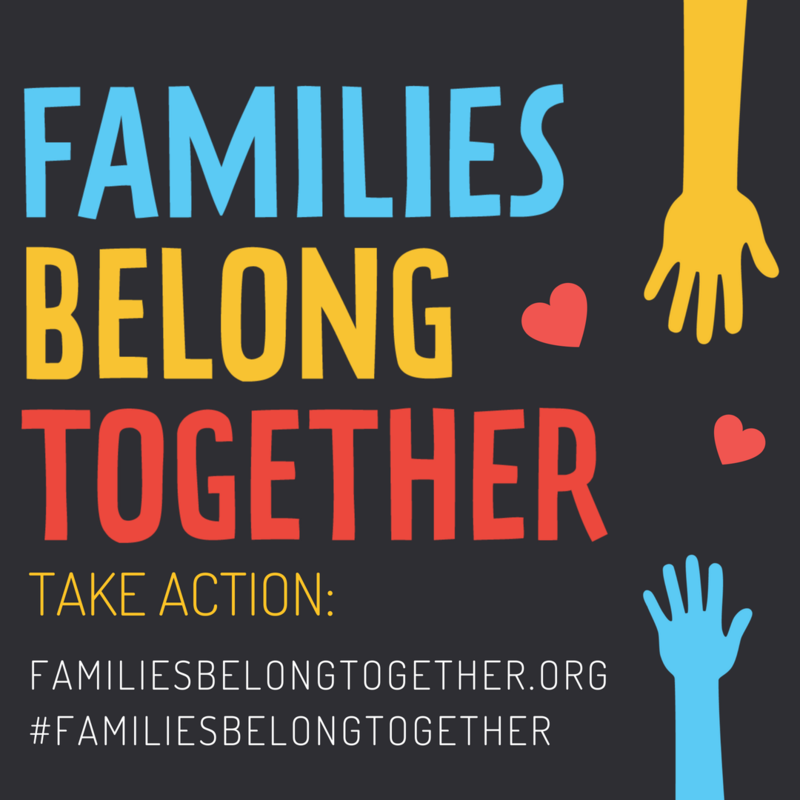 I’d be excited to know if anyone uses these suggestions for their wedding, Quinceniera, prom, or any other event that requires a huge, frilly ballgown. At any rate, if you’re having a wedding, make sure to outfit your bridesmaids in appropriately ornate dresses. The dresses don’t have to outshine you, but just don’t make them look like your ugly stepsisters. If you do that, expect the fairy godmother to turn you into a pumpkin.